A new clinical trial has verified the efficacy of a new form of 'spray-on skin' containing skin cells and a protein-clotting solution. A phase 2 study was performed to compare the skin spray with conventional treatments. It included 228 adults from 28 different centers in the US and Canada. Each one had up to three skin ulcers measuring 2 to 12 square centimeters which had persisted for 6 to 104 weeks. The spray itself is comprised of two types of skin cells collected from the foreskin of babies: keratinocytes and fibroblasts, the cell types that become dysfunctional in chronic skin ulcers. These neonatal keratinocytes and fibroblasts are dosed with radiation shortly after being collected to stop them from growing. Mixed in is a protein-clotting solution that works with the cells to create a self-assembling matrix that promotes healing. 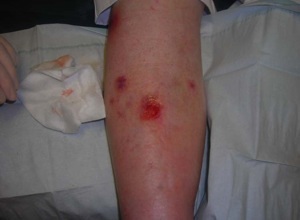 The double-blind, randomized study demonstrated that venous leg ulcers can be healed with the 'spray-on skin' solution, applied every fourteen days. Robert Heinlein thought about this idea even earlier. In his 1951 novel The Puppet Masters, he wrote about surrogate skin that could be sprayed onto hands with minor burns. From The Lancet via Singularity Hub via Frolix_8.